Once we enter this magical place, we encounter a whimsical world of insight and inspiration. Paulina Tarot follows closely the traditional structure of Rider-Waite Tarot. Yet artist Paulina Cassidy has created delightful characters and eclectic symbolism, that is uniquely her own. Her broad range of influences include Victorian costumes, Mardi Gras flair, holistic healing, and dream imagery. Magical creatures like dragons and flying horses make surprise appearances. Painted in soft, muted pastels with exquisite details, Paulina Tarot is a romantic deck and a completely accessible one to be treasured by tarot lovers everywhere, especially those who appreciate superb artwork. 78-card deck with instruction booklet. The artwork (done with watercolors) is very much along the lines of whimsy and fantasy. The colors are muted pastels, more towards browns, grays, yellows and greens, with the occasional red and orange. The imagery in the cards is a combination of the traditional imagery seen in the Rider-Waite-Smith Tarot, and the creatures of spirit that wanted to be included in the cards (this from the author). I did find that each time I looked at a card, I saw something new and interesting. My thought with this deck is that what needs to be seen will be seen each time the cards are read. I found that the imagery in this deck simply pulled me in! Very delicately done, following tradition, with the addition of many whimsical elements. Each card adds to a wonderful fantasy world, replete with faeries, forests, plants and animals, and unique symbols in the background. This is a deck that could be used under any circumstances, even when reading for children. It would be an excellent addition to any Tarot deck collection. Paulina Cassidy has created this delicate and romantic seventy-eight tarot deck with instruction book (LWB). The cards are definitely packed with detail. It is charming, has a Victorian flair, with a hint of New Orleans, Mardi Gras. Many of the characters in her art have a porcelain doll-like quality and are wearing Victorian period clothing. The deck contains much of the Rider-Waite-Smith symbolism, as that was her earliest tarot influence. Paulina’s chosen modality for this deck is watercolor. The artwork is done in soft, muted shades. Using this deck gives one the feeling of stepping back into a time of whimsy and magic. It takes you to a place where Dragons and Pegasus fly and many other magical creatures live side by side, comfortably with humans. Paulina mentions in the little white book, that she knows that these creatures exist even though they cannot be seen by the naked eye. You will also note many birds, butterflies, dragonflies, all in magical forest and woodland settings. This deck would be a nice fit for beginners as well as for the professional reader (especially anyone who may doing readings at a venue with a theme, such as a Mardi Gras party). The deck is also suitable for all ages. It will be enjoyed by anyone who is interested in a Rider-Waite-Smith type deck, but looking for something a little more whimsical. The Paulina Tarot is absolutely gorgeous! The cards are an average sized US Games deck, both same in height and width as popular decks like the Fantastical Creatures and Fenestra Tarots. The box is a bit deeper, however, allowing more room for a nicer printed LWB. The cards are neither a high gloss nor a dull matte, but a pleasant "in between" that allows the colours to pop, but not to shine and reflect other lights. The colour scheme of the deck is what I would refer to as a rich watercolour. Soft in some places and a few tones deeper in others. This is not what one would consider a jewel toned deck, for it has a much earthier appeal to it. This deck nicely reflects the seasons, especially spring and summer. Wildflowers, birds and bees abound, with other creatures both familiar and unfamiliar. Fae-like characters dwell in this enchanted realm and the artist brings us directly into the mysterious hidden world of the garden, field and forest. Drawing on inspirations like New Orlean's Victorian-Era Mardi Gras and the pages of fairytale books, these creatures are donned in whimsical costumes, masques, stars and bells. The artwork is incredibly intricate and detailed and it takes a lot of time to discover the many hidden enchantments on each card. Expect the unexpected! The entire deck follows the RWS traditional meanings with an exquisite approach, making it highly readable, but the elaborate artwork allows for much development on the intuitive side. The cards have a small white border with the titles written at the bottom, so nothing is lost from the images themselves. 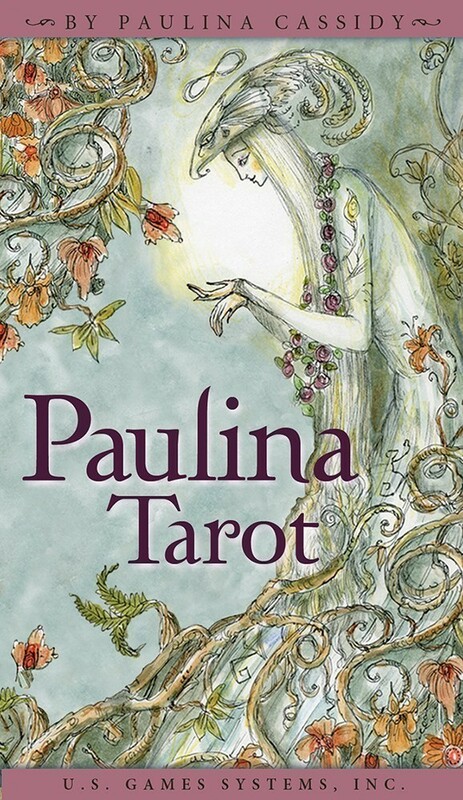 Unique, exquisite, charming and thoughtful, the Paulina Tarot is a treat for both readers and collectors, alike! Sprightly delicate creatures dance upon branches, while festooned women celebrate around an unusual tree sprouting geometric boxes. 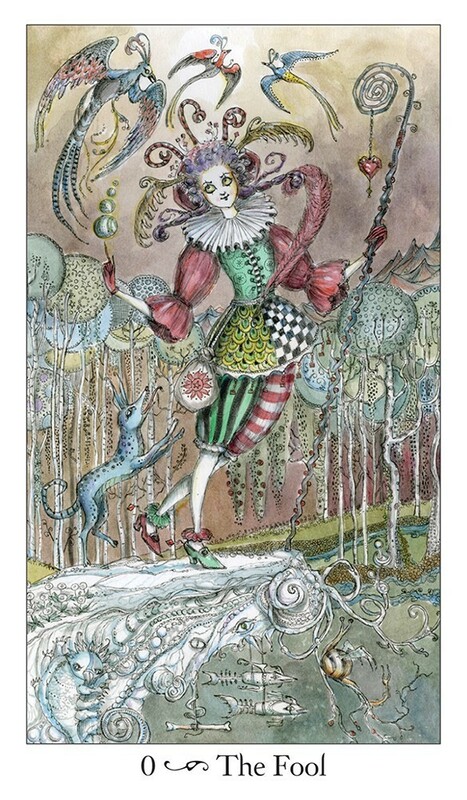 Animals from both this earth and an otherworldly one dot the enchanting landscape of the Paulina Tarot as do characters bedecked with colorful early Mardi Gras, Victorian-influenced costumes. 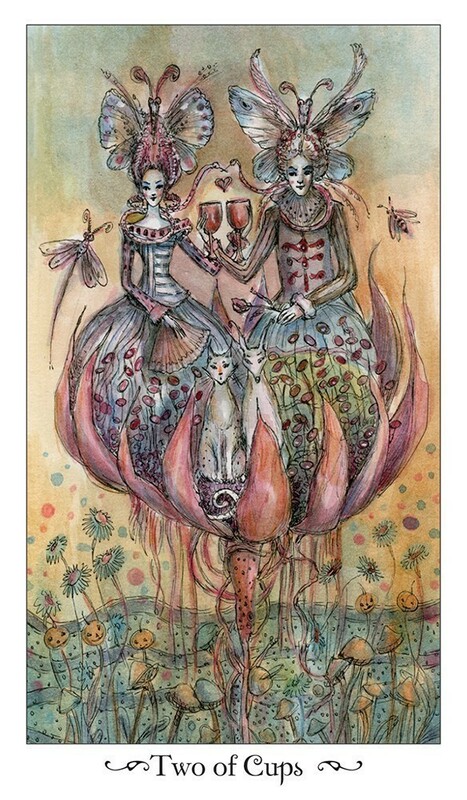 Reflecting artist Paulina Cassidy’s affinity for the city of New Orleans, the Paulina Tarot reflects Rider-Waite-Smith structure, yet imparts a fresh, lighthearted perspective to the cards. Delightfully detailed and gracefully rendered, the artistry of this deck invites users to come along for a magical ride that, while whimsical, captures the everyday situations, emotions and dilemmas faced in the ordinary world. I've found the Paulina Tarot to be a playful deck, while still speaking to the inner world (and issues) that often brings us to do readings in the first place (especially when it comes to reminding me not to work so hard and expect so much of myself!). I love working with the Paulina Tarot especially for personal readings and journaling! With intricate line work, fanciful characters, and muted watercolors, this deck pleases the eye and lifts the spirits. But, truly, it's not just a "pretty" deck; the Paulina deck imparts illuminating wisdom, emotional comfort and pointed answers for those who go beyond its lovely surface. This deck is full of stunning detail with black outlines and dreamy water coloured pallet. Even though the art is done this way it is not at all washed out and it is full of vibrant colour. 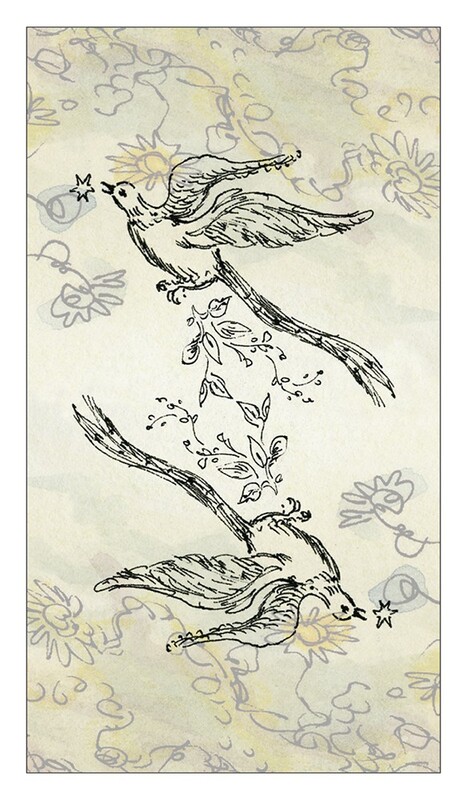 The back features two birds on a cream background, which is classic and feminine. It showcases many little creatures of the night, quiet gothic looking people and central figures, fae, fairy tale characters and pretty much anything else from a gifted imagination. This deck has a gothic like theme, which will definitely find an audience with young adults, as it is still quiet romantic and not too dark. It has some splashes of Tim Burton and Dr Seuss hidden within her artwork, but it does not take away from her creation at all. The artist and author of the booklet actually set out to create a Tarot Deck allowing the symbolism to draw her in, this incredibly detailed piece of work took her over a year and a half to complete. 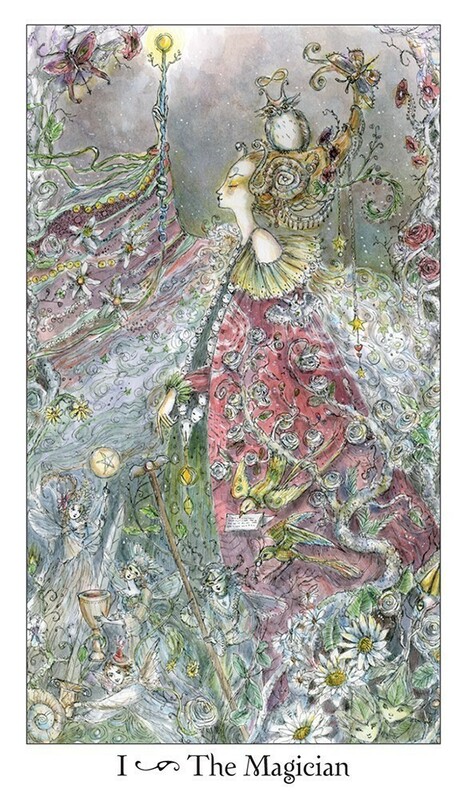 The Paulina Tarot is elegant, detailed and full of stunning imaginative artwork and I highly recommend it. The Paulina Tarot was created by Paulina Cassidy, a talented artist who created these cards based on her own personal imagery and vision. This deck does not contain traditional imagery, though the basic narratives of most of the cards are similar to the Rider-Waite deck but Cassidy adds her own elements, such as a frequent use of keys, eggs, and flowing, natural imagery like branches and stars. The overall feeling is one of whimsy and play, but there is much more to this deck than it might seem at first. Note here the ways that this card is traditional (the pomegranate, the moon, the idea of a veil or curtain), but look at what Cassidy adds here -- with her High Priestess, the veil is actually within the priestesses body. When the veil is peeled back, you don’t get her body, but eyes in darkness, a scroll, and the pomegranate. By putting these “mysteries” inside her body, Cassidy deepens the symbolism here -- this high priestess embodies mystery in a very physical way in this card, not just as a static figure but in her body as well as in the things she carries. In this deck, unlike many I’ve seen, Cassidy does a fantastic job with the Court Cards, which are not only hard to read sometimes, but also hard to give personality. Like the Major Arcana, the court cards can seem a bit static–they don’t really have a story and represent types of people or emotional states. Cassidy, though, makes each court card unique and fills them with personality and intent. Just take a look at the Knight of Swords, who just screams craftiness, intelligence, and danger. Overall, this deck is lovely, layered, and contains surprising depth which might not be evident if you focus on the swirling, playful surface. I highly recommend this beautiful deck. Where can I start? I have been watching this Tarot develop on the artist’s website for the past few years. Now I hold the finished product in my hand. This is a masterpiece as far as Tarot decks go. It takes the traditional images to a new and very, very, detailed level that should your tastes favor this interpretation, you will find a new favorite. In the endless Rider Waite clones that get stamped out each year, Paulina Tarot rises above the herd. I generally prefer a very boldly colored deck for easier interpretation. It is true, the colors are subtle and easy on the eye. Yet, they are no less vivid. I adore the delicate lines and layers of every card. This is not my first deck, and will not be my last. I collect decks, most are locked away as art decks. This one is very useable as well as aesthetically pleasing. Your clients get a visual treat, as well as very accurate advice. Whimsical, dreamy and nostalgic, I cannot stop singing the praises of this labor of love. I followed Paulina's plight in New Orleans, after Hurricane Katrina. Indeed, the frailty of life is reflected in this deck. It will remain near & dear to my heart! If you feel there are too many decks published annually, treat yourself to this one. It is the new pinnacle as far as other Tarots are concerned. Good luck topping this one. 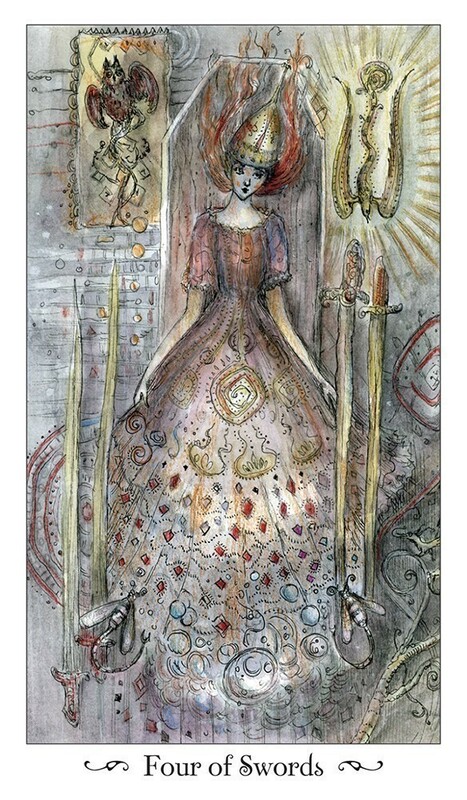 The Paulina Tarot is a unique and charming approach to Tarot imagery, with a slyly engaging spin on the cards that visually and thematically owes very little to either the RWS or Crowley canon. Cassidy sinks her taproot into the eerie and lovely realm of the Fey for her creation. The art reminds one of the elegant "arty" illustrations from the sixties, albeit with a sharply sweet kick. There is also something of the fairy illustrations of the nineteenth century in the endless cascade of detail on each card, which draws one in. Every time one looks at a card one sees something new. A faintly "gothic fairy" feel to the figures with a lot of winks and nudges makes a reading seem a little like a dialogue with eldritch creatures. Even the minutiae is clever, fresh and witty, and the rich yet subdued palate is seductive. There are lots of odd creatures skittering through the cards, all of them engaging without being cloying, even when they are genuinely spooky. The deck reads beautifully, enabling one to focus on difficult issues with a gentle touch. While not to every taste, for readings or contemplation the Paulina Tarot can be a delightfully unique and endlessly rewarding ramble through a refreshingly non-saccharine fairyland. The Paulina Tarot deck just pulled me to it. The artwork is full of whimsy and soft, soothing colors. Each time I look at the cards I find something I missed the time before. These cards are so easy to read and I'm thrilled to have a deck. I would recommend these to everyone. Readers who are just getting started will find these are a very good beginning deck. Experienced readers will enjoy finding new symbols with each new reading. I love this deck. 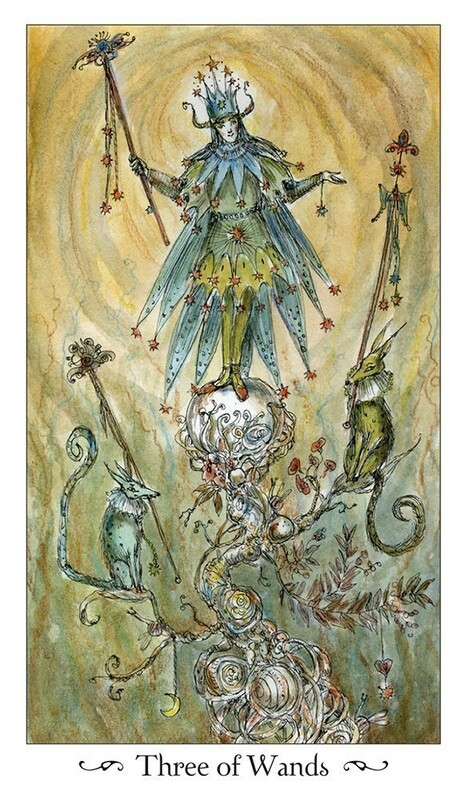 The Paulina Tarot is a beautiful tarot deck -- it has a dreamlike quality that really connects with your intuition and spirit. I have had this deck for about a month now, and it is truly one of my favorites in my growing collection. I have used it many times, and get very powerful and accurate sessions. This is one of those rare tarot decks which has not only fabulous art, but also much symbolism and detail that really contribute to strong readings. 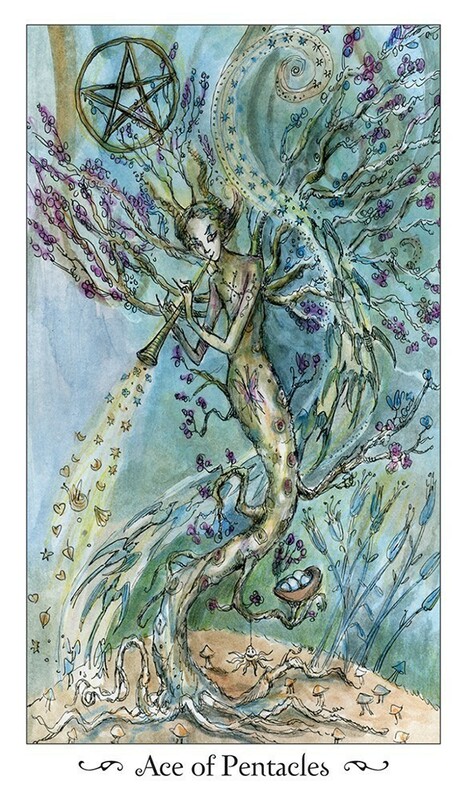 I love the Queen of Wands in this deck, especially! What a fabulous conception -- the cat is huge and very mystical looking, next to the queen. The two of pentacles reminds me of one of Chagall's circus riders. The Star is especially lovely too. I love this deck!